Nautical by Nature: Marley Lilly Monogrammed Cell Phone Case Giveaway! Oh my goodness, what a great giveaway! I love the Blue Sun Swirl case! I "liked" Marley Lilly and Nautical by Nature on FB and I follow Marley Lilly on Twitter. I want to win this so bad! My favorite thing from Marley Lilly has always been the Monogram Cut Out Sterling Initial Ring. I have been wanting this forever! I like Marley Lilly and Nautical by Nature on facebook and I already follow Marley Lilly on Twitter. Wow i've never seen the Marley and Lilly website before and I think I've found a new addiction! My favorite is the Sweet Retreat case! I "liked" both Nautical by Nature and Marley and Lilly on facebook, followed both on twitter and am working on mentioning this giveaway in my next tweet! 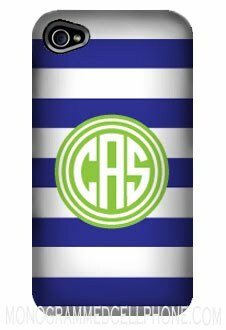 I was just thinking recently about how much I want to get a monogrammed case for my iphone, so it would be perfect if I could win this giveaway! My current favorite item would have to be the monogrammed baseball cap. So cute and it will probably be my next purchase. I like Marley Lilly on facebook and follow it on twitter. Adding this giveaway to my sidebar now. What an amazing giveaway! I love the 16 oz. double wall acrylic cup with the initials- especially the pink and green one! Thnak you for this amazing giveaway! Loving this! I've been searching for a new case for my iPhone!! My fave product on the Marley Lilly website is the floppy monogramed hat (getting myself one of these for the beach!). I like Marley Lilly as well as Nautical by Nature on Facebook (and I follow both on twitter), and have tweeted about this giveaway (@ashley_vt). I LOVE Marley Lilly! Currently, my favorite product is the derby monogrammed hat. I just bought another one in straw (natural) with black lettering, I can't WAIT to get it!! Like Nautical By Nature on Facebook! I love the Wide monogrammed cuff bracelet. This is a great giveaway. I have been wanting a monogrammed cover for my phone forever. I like Marley Lilly and NBN on FB, follow ML on Twitter and commented here! I want a cellphone case! I think I'm definitely going to buy one of the monogrammed wristlets, great price and they look like Longchamp bags!!!!! I like Nautical by Nature on Facebook. I love the Limeade Lightening cell phone case...it's so chic! Great giveaway! This is SUCH a great giveaway, I have been eyeing these for quite some time! There are so many great things to choose from on the Marley Lilly site, but I am loving their filigree monogram necklace & the champion wristlet! I have already 'liked' Marley Lilly and I 'liked' Nautical by Nature on facebook and I follow Marley Lilly on Twitter too! Great giveaway! I think the monogram croakies are the best! I like Marley Lilly and Nautical by Nature on FB. Love this! Even if I don't win I would certainly by one, love the initial rings though! I like Marley Lilly on Facebook and follow on twitter! I love the tube cooler! I "liked" Marley lilly and i "liked" nautical by nature! I need an iphone cover so so so bad!! I really want to win this! I can't imagine how I would ever decide which case to get though because they're all so amazingly cute!! I'm really drawn to the Southern Seersucker, and the Polka Dottie! I love the Damask Curtain case!! These cases are adorable...I would love to make one mine:) As for my favorite product-I LOVE the monogram cut out gold 3 initial ring!! So going to ask for that for my birthday! Also, I liked Marley Lilly & Nautical by Nature on facebook, and followed Marley Lilly on twitter! I love the BFF phone case! So cute! I liked Marley Lilly and Nautical by Nature on FB and follow Marley Lilly on Twitter. What a great giveaway! I'm probably going to order the phone case even if I don't win, but I really hope I do! Aside from the amaaaaaazing phone cases, I love the cutting boards!! So cute and they match my kitchen!! I "like" ML on Facebook and already have plans to get the floppy beach hats as bridesmaids gifts for my wedding! These are just the cutest gifts, thanks for offering this giveaway! The tote bags have always been my favorites.. I think the Pink Boat Tote most of all. Also LOVE the monogrammed summer hat though. I love the cosmetic bags! I was just about to order the monogrammed iphone case! Thankfully I was reading all of my fav blogs this morning first! Hopefully I win! I liked Marley Lilly on facebook. I liked nautical by nature on facebook! My favorite thing from Marley Lilly is definitely the Double Wall Acrylic Cup! So cute! and I "liked" Marley Lilly and Nautical by Nature on FB and follow Marley Lilly. I need the Personalized Khaki Weekend Travel Bag!!! LOVE the limeade chevron cell case! So cute!! I "like" Marley Lilly and Nautical by Nature on FB! Oh…and I liked Nautical by Nature on FB as well. I love the Monogrammed Cell Phone Case- Boyfriend Stripes! So adorable! I love the Limeade lightning & southern searsucker! I love Marley Lilly's clutch!! It would be perfect to bring to football games!! I also follow Marley Lilly on Facebook and Twitter. I also follow Nautical by Nature on facebook. American Seersucker! I love stripes and it looks nautical!! I love the Marley Lilly hat, I have really been wanting one! I think it's perfect for summer. I 'like' Marley Lilly on FB. I 'follow' Marley Lilly on Twitter. I 'like' Nautical by Nature on Facebook. 1. I absolutely love their floppy hats!! I've been dying for one of these cases! Perfect timing! My favorite Marley Lilly product is the monogrammed scarves! They're so soft and done wonderfully, but a great price! I like Nautical by Nature on Facebook too! Fabulous giveaway! It would be great to have something with my new monogram!! My favorite is the "Strict Teacher" phone cover. My favorite item is the wristlet purse! I like Marley Lilly on Facebook and follow on twitter! Thanks Kate, and hope you're having a wonderful fabulous summer!! love the stripey cabana beach towels!! My favorite item is the cell phone case in Coastal Seersucker! I love the Marley Lilly Preppy Argyle case. So pretty! I love the Marley Lilly "Preppy Argyle" case. I hope I win this one! My favorite item from Marley Lilly is the Personalized Navy and Green Duffel. Such cute colors and you can get your name, sorority or team on the bag. Its perfect for weekend trips to visit friends at other schools. 3. I also like NbN on Facebook. I've been looking for a new cell phone case. These are so cute! My favorite item would have to by the Monogrammed Sterling Necklace. I liked ML on FB, followed ML on Twitter, and liked N by N on FB too! I love the lounge chair cover! I love the champion wristlet they have, so cute!!!! Ooh, my favorite product is definitely the monogrammed floppy hats! I like Marley Lilly on FB and follow them via twitter, too. Love your blog! Love Marley Lilly! and I love this giveaway! 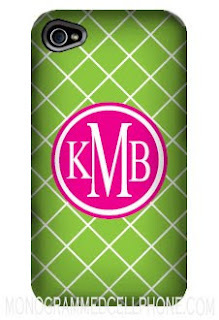 The girly cabana monogrammed phone cover is to die for! So thats five entries! Hope I win! LOVE LOVE LOVE Marley Lilly! My favorite are the monogrammed sun hats! Thanks for the fab giveaway! Love your blog! I love the southern seersucker. I am now following Marley Lilly on twitter. I follow Marley Lilly on Twitter and liked Nautical by Nature on FB! I would love a new case for my new phone - my phone fell out of my purse in my car and the case chipped :-( Marley Lilly products are so fun - wish my funds were unlimited! I love love love the preppy paisley case! I love the monogrammed pashminas! 2. I like Marley Lilly on FB. 3. I follow Marley Lilly on Twitter. 5. I like Nautical by Nature on FB. I absolutely love the "Monogrammed Cell Phone Case- Girly Cabana." So cute and definitely my style! I love the Monogrammed Champion Wristlet! i love the pinked polka dotty one :) sooo cute! I liked Marley LIlly and Nautical by Nature on Facebook! Loving the computer covers. I totally need one too! Already a FB fan. I'm following Marley and Lilly on twitter. And tweeted! This giveaway is AMAZING! 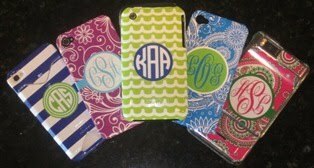 I adore the monogram cell phone cases - especially the cheetah one! I like Marley Lilly on Facebook and I'm a Twitter follower. So many cute things! Love the Monogrammed Solid Pashmina Scarf... I think I just found my bridesmaids gifts! Following Marley Lilly on Twitter. Like both Marley Lilly & Nautical by Nature on FB. love marley lilly's new monogrammed fleece jackets and REALLY love their monogrammed cut out jewelry! By far my favorite item on the Marley Lilly website is the Monogrammed Cell Phone Case- Southern Seersucker! also, I follow them on twitter and I am a facebook fan! I also like you on FB :) yay!! Oh I love the giveaway! Marley Lilly has the cutest stuff! Currently I'm loving the Tammy Sterling Silver Ring. I like Marley Lilly on Facebook and follow them on Twitter! My favorite is the Filigree Monogram Bracelet Sterling Silver! so cute! and would be matchable for all occasions! I like nautical by nature on Facebook! !